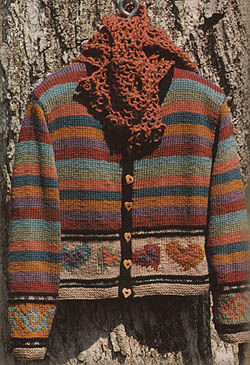 A multi-colour cardigan design from the Mission Falls Harvest pattern book! The jacket is shown accessorized with the long version of the Flirty Crochet Scarf knit in Nectar. If you would like to order the kit with alternative colours and/or buttons, please specify these in the comment field of your order form. The pattern is not included in the kit but is in the Mission Falls Harvest pattern book (pictured at right) which can be ordered separately. Normally priced at $14.95 CDN ($12.95 US), if combined with any order of 5 skeins or more of Mission Falls yarn, the Harvest book is priced at $9.95 CDN ($8.65 US). If you would like us to quote a price for this kit in Mission Falls 1824 Cotton Yarn please contact us by phone or email.